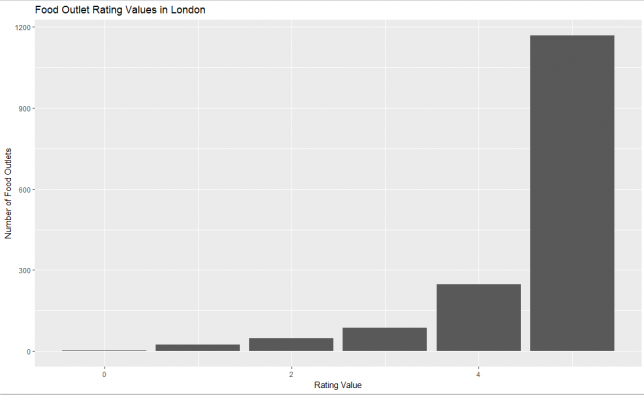 Rachel Oldroyd, one of the UK Data Service Data Impact Fellows, takes a step-by-step approach to using R and RStudio to analyse Food Hygiene Rating Scores. In this tutorial we will look at generating some basic statistics in R using a subset of the Food Hygiene Rating Scores dataset provided by the Food Standards Agency (FSA). Visit http://ratings.food.gov.uk/open-data/en-GB now and download the data for an area you are interested in. I’ve downloaded City of London Corporation. R is able to parse XML files but it’s easier to load the file into Excel (or a similar package) and save as a CSV file (visit this page if you’re unsure how to do this: https://support.office.com/en-us/article/import-xml-data-6eca3906-d6c9-4f0d-b911-c736da817fa4). R is a statistical programming language and data environment. Unlike other statistics software packages (such as SPSS and Stata) which have point and click interfaces, R runs from the command line. The main advantage of using the command line is that scripts can be saved and quickly rerun, promoting reproducible outputs. If you’re completely new to R, you may want to follow a basic tutorial beforehand to learn R’s basic syntax. 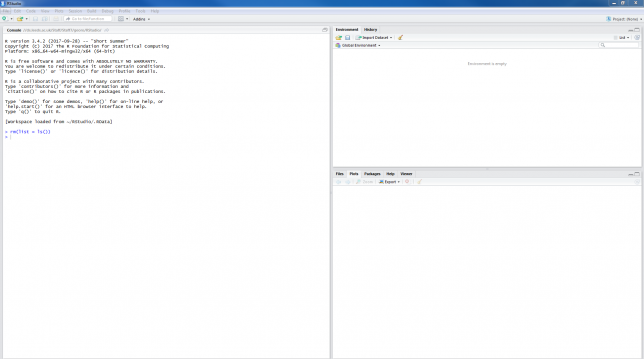 The most commonly used Graphical User Interface for R is called RStudio (https://www.rstudio.com/products/rstudio/) and I highly recommend you use this as it has nifty functionality such as syntax highlighting and auto completion which helps ease the transition from point and click to command line programming. Don’t worry if your screen looks slightly different, you can visit View > Panes from the top menu to change the layout of the windows. The console area is where code is executed. Outputs and error messages are also printed here but content within this area cannot be saved. As one of the main advantages of using R is its ability to create easily reproducible outputs, let’s create a new script which we can save and rerun later. Hit CTRL+SHIFT+N to create a new script. Save this within your working directory using the save icon. into the script file and again hit CTRL + Enter whilst your cursor is on the same line to run the command, you can also highlight a block of code and using CTRL + Enter to run the whole thing. You should see a file browser window; navigate to the CSV file you saved earlier containing the FHRS data. Note the syntax of this command, it creates a variable called data on the left hand side of the equals sign and assigns it to the file loaded in using the read.csv command. Once loaded, you should see the new variable, data, appear in the environment window on the right hand side. To view the data you can double click on the variable name in the environment window and it will appear as a new tab in the left hand window. Note the variables that this data contains. The object includes useful information such as the business name, rating value, last inspection date and address. here we pass our data variable into complete.cases which removes any incomplete cases and overwrites our original object. Note how we use the $ to access the variables of our data object. Rachel Oldroyd is one of our UK Data Service Data Impact Fellows. Rachel is a quantitative human geographer based at the Consumer Data Research Centre (CDRC) at the University of Leeds, researching how different types of data (including TripAdvisor reviews and social media) are used to detect illness caused by contaminated food or drink.